The Darkness assumes that the reader will remember from The Unimaginable Road who all of these characters are. Tust is Tust Turtle, Kelly and Slither are Snakes, Fespin is Fespin Squrrel, Hillany is Hillany Chicken, Inkwell is Inkwell Pig, Taj and his mother Arlafette are Spaniels, Albin is Albin Eagle, Mander is … well, if you don’t know what Mander and the others are, you definitely need to read The Unimaginable Road first. It is hard to visualize these characters except as “funny animals”; all the same size and with limbs as humans. Drueding says in his Foreword that the animals are humanoid. On the streets, Kelly paces unhappily, glancing at the entrance to the forest nearby. She spots Slick crossing from the dining hall to the science building and she rushes over to him. ‘Give me a reason,’ she pleads. That’s a snake pacing and rushing, and another snake with a prehensile tail. Are the hard hats and tool belts all that the animal construction workers are wearing? And why is one dog generic while the other is specified as to breed? Is Dovan a mongrel? But the mysteries are compelling. Who is the killer in their midst? Is he or she working for the government’s Criminal Activity Counterforce, which believes Arraborough to be a gathering of troublemakers and is looking for an excuse to abolish it, or for the illegal Serpent Society? What is the secret of the caverns beneath Arraborough, which nobody is supposed to enter? Are Dovan Blue Dog’s and Wild Boar’s strange cases of amnesia connected? What does Mobane Dog really want? 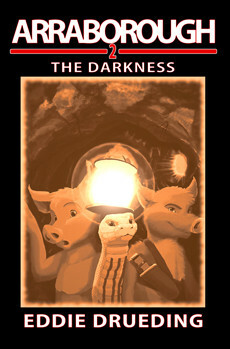 The blurb ends, “In Arraborough, there are no heroes, and in the end, the Darkness will claim them all.” That sounds like a final and fatal conclusion to the series, but in fact The Darkness ends with another cliffhanger and a “To Be Continued in Arraborough, Book Three: Moth and Rust”. Really, Arraborough is a single novel. Its anthropomorphism is strange, but it is very readable despite this. The bottom line: Don’t miss it. 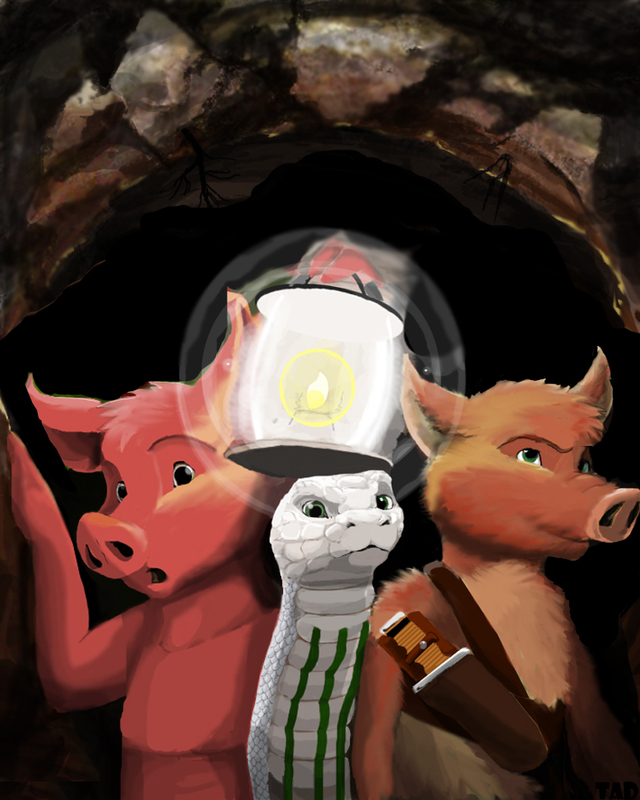 The cover [early color version] by Tad Cooga shows Inkwell Pig, Slick Snake, and Peck Bushpig exploring the caverns beneath Arraborough. In fact, all the animals share the same lifespan - all living to only 15 or 20, with no deviation among species. I can't believe this discrepancy in the foreword wasn't apparent to me before now.